The last day we were in the USA, we were loitering around LA before boarding an 11pm flight home. We spent about three hours in the sublime Museum of Jurassic Technology and a block or two away was a Goodwill. With a burning desire to use up my last USA paper money, I launched into the half-price sale therein a determined woman. 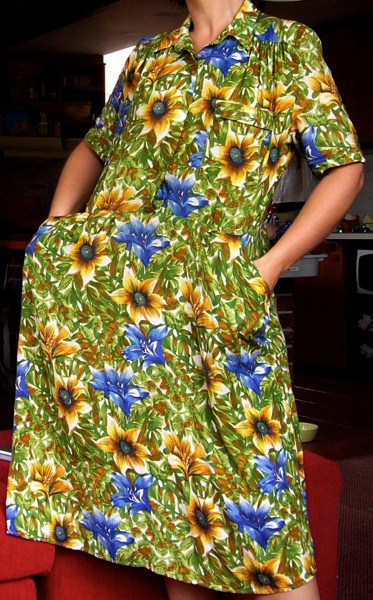 I bought a huge, tent-like rayon shirtdress, 1980s I think, in an almost tropicale but slightly naff floral print. I didn’t try it on. 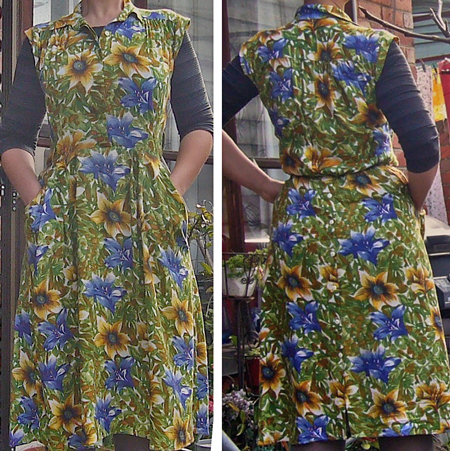 It was way too big, but had pockets and a buttoned placket down the back of the skirt. For four bucks, I could do something with it. If nothing else, I could use it as a proof of concept. 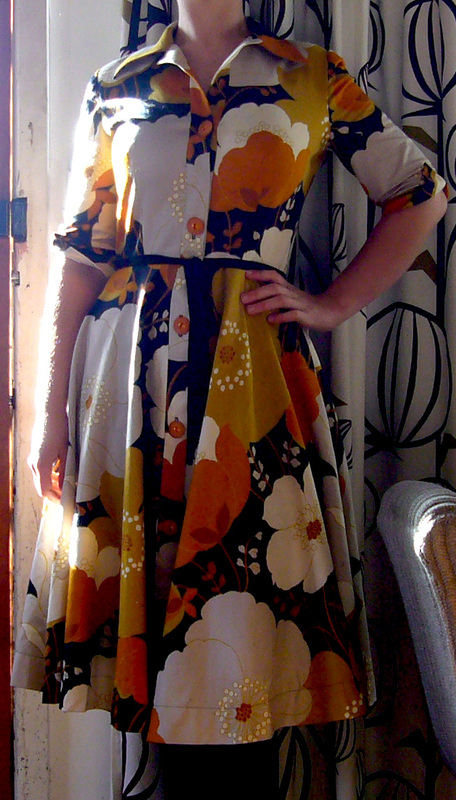 Imagine my delight when I got home and tried it on. Prepare to be dazzled! Gaw-geous, right? *shudder*. 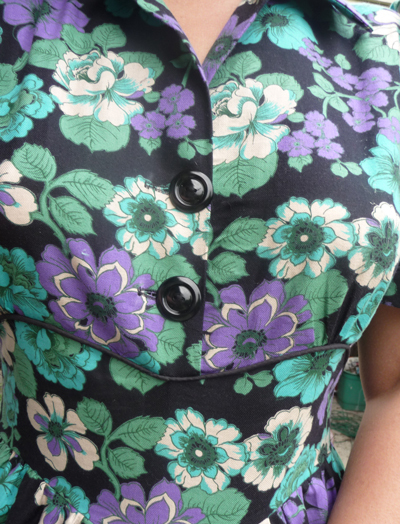 I’ve seen so many dresses just like this and thought, that could be reworked, but who can be bothered? Here’s what I did – you tell me if if it was worth the effort. 1. WASHED it to rid it of traces of previous ownership. Stain remover on a couple of spots. 2. 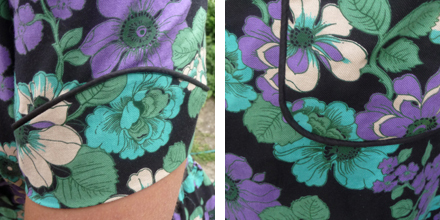 Removed the big ugly pocket on the bodice. 3. Took off the skirt. Added extra darts to reduce the waist diameter of the skirt. 4. Added six darts to the bodice front. 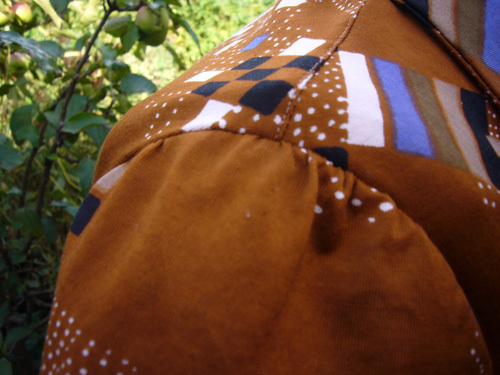 Evened up the bottom of the bodice where it had stretched out. 5. 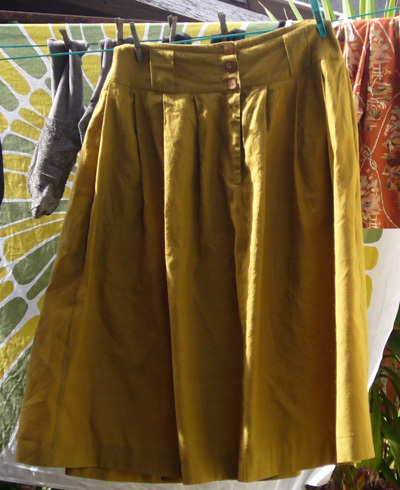 Reattached skirt, gathered the back and inserted a strip of elastic in the back waist seam. 6. Cut off sleeves. Made thick bias strips from them and attached them around the armscye like a cuff. 7. Sewed up side bodice seams, taking it in a couple of inches each side. 8. 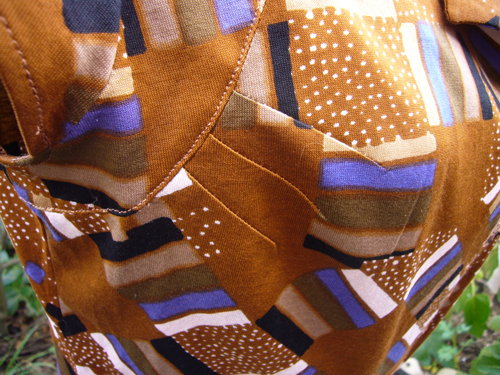 Reattached a button and sewed up the bottom of the front placket where it gaped a bit. Fit is good, and why didn’t anyone tell me rayon was so damn comfortable to wear? Pity about the placement of those two yellow flowers on the bustular area. That print is still a bit naff. The modifications weren’t that hard. Maybe it’s time I got a better camera. The ingredients: Vogue 8613 and a bunch of poly-blend 70s jersey picked up for a song in a westside op-shop. Not too bad. 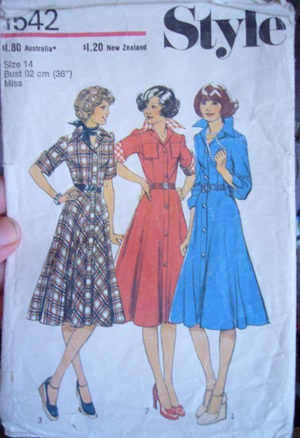 I was aiming to test the pattern and perhaps wear the muslin. I reckon this is wearable. I made the bodice and found it to be waaaaaaay too short. Thusly the waist band insert. Worked OK but next time I’ll remember to cut it longer. Damn you, Vogue. Why don’t you just draft a sleeve that fits? 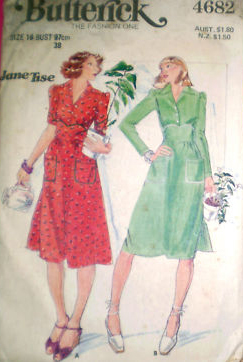 Last week my Jane Tise Butterick 4682 pattern arrived – remember, the one I’ve been thinking of for three years? So I set about making it with rare fidelity to the pattern’s instructions. Usually I change this or that, due to laziness more often than not, but this time I swore I’d be good. I piped everywhere that I was told to pipe..
Piped pockets ROCK MY WORLD. I’m a total convert. 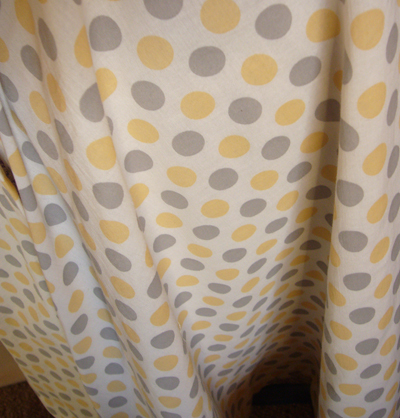 There’s a real risk that everything I make will now have piped pockets. I love it. It’s garish and a bit mad. All thanks to Nora, three years ago. Hurrah! 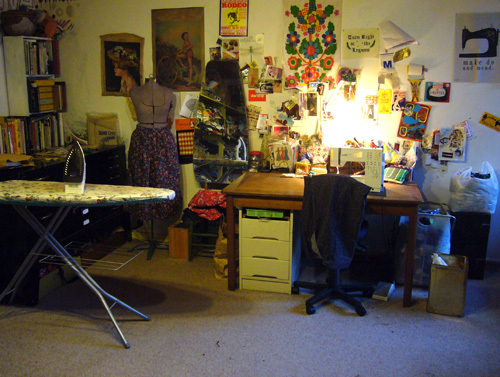 I suaved out the pigsty that was my sewing room and with the cleanliness and order came inspiration. So nice to have my sewing mojo back. 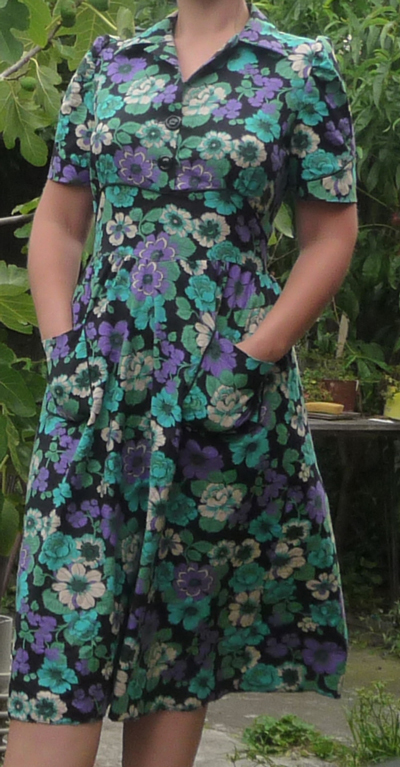 And to have made a new frock I really, really like! 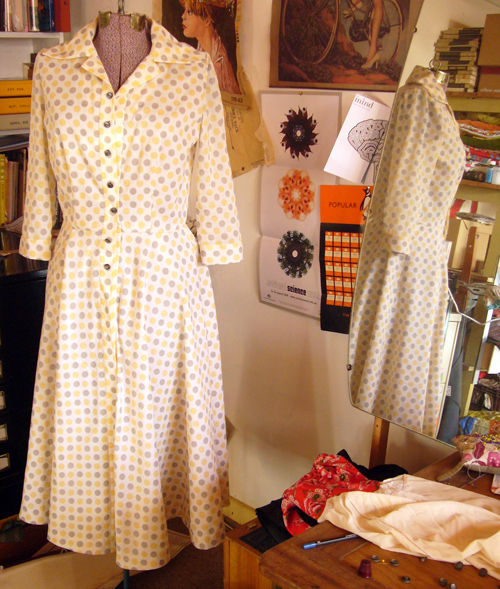 It’s a 1976 pattern made up from old curtains kindly given to me by a friend in a de-stashing frenzy. There was a bit of light damage but I just cut around the worst marks. 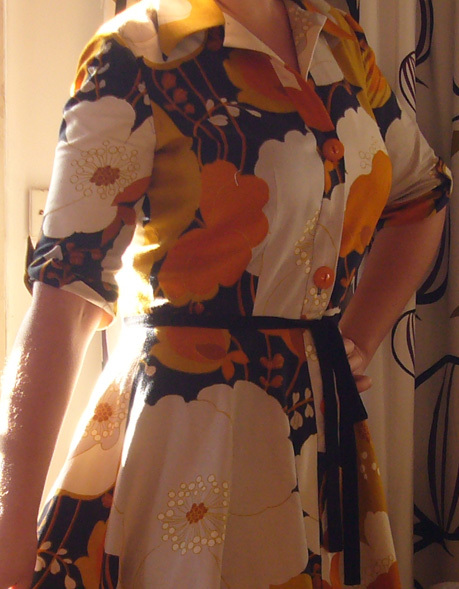 Only a couple of modifications – added length to bodice and skirt and made the sleeves longer with a kicky little turn-up. Love, love, love it. The swingy skirt is just the best.